“Lazy” might not be the best descriptor. Alan’s taken the last week off from work to spend time with his kids. Yesterday I joined them for an afternoon at Splashdown Waterpark in Manassas, VA. 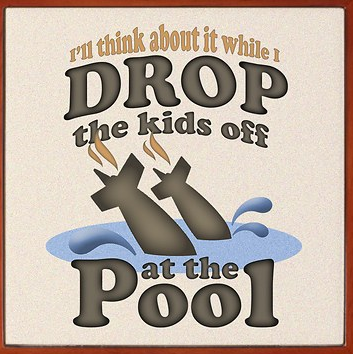 While I like water, places teaming with children are generally not high on my list of places to go. That’s about as descriptive as they would get, but it’s pretty clear someone either pooped or threw up in it. Since vomit would likely scatter, I’m guessing the former was the culprit. Well, my guess is based on that and the fact that I’m pretty sure I saw three turds bobbing along the river with lifeguards pointing at them as we left the park. Once you know someone has taken a dump in the Lazy River, it’s pretty hard NOT to think about the amount of pee swirling around your legs. To put myself at ease, I persuaded myself that the pools had been treated with a chemical that would turn all pee hot pink (as we were led to believe might happen when we were little), so that I could pretend I was not, in fact, in a large toilet. Bathroom concerns aside, it was actually a pretty great day. The weather cooperated. The kids enjoyed themselves. And even if what you’re splashing in is pee, it beats a day at the office. Sign me up! ← You know you’ve done this. I’m highly disappointed for no Bill Murray Caddyshack reference. It’s like leaving out the tortilla from a burrito.